At the Rett Syndrome Center at Montefiore, NY, eye tracking technology was used in order to compare patterns of visual processing in Rett Syndrome patients and non-Rett control subjects. Rett Syndrome is the most physically debilitating neurodevelopmental disorder on the Autism Spectrum and one of the leading genetic causes of severe impairments in females. Today, 45 years after the syndrome was identified, we still do not understand if, and how much girls and women with RTT understand, how much they remember, or how they process information. Profound impairments in their abilities to speak, walk, and use their hands (caused by apraxia and other movement disorders) severely limit the ways in which girls with RTT can express themselves and are understood. Motor difficulties and apraxia also limit the abilities of RTT girls to respond to questions during standardized neuropsychological testing, which may lead to underestimations of their cognitive abilities. "Eye gaze technology allowed us to give Rett Syndrome patients a voice – a way to communicate their perception of what they see. This is of immeasurable value because most of these patients have no other way to communicate their knowledge or understanding due to extreme physical disabilities." Goal 1: Qualitatively compare the abilities of Rett Syndrome patients to identify focal points within images. Basically, answer the question: Can Rett Syndrome patients differentiate between the more important and less important aspects of an image by giving more attention to the relevant (focal) stimuli? How long it takes Rett/non-Rett individuals to look at the focal point of an image. How long the first fixation on the focal point lasts. How long the individuals spend looking at the focal point. How many times the individuals looked at the focal point. 31 girls with Rett Syndrome were involved as test participants in the study. The control group consisted of hospital personnel, research team members, and parents. A total of eleven images were presented to the test participants via the Tobii T120 eye tracker. These images consisted of photographs of real situations, faces, shapes and cartoons. Viewing time was 5 seconds. To minimize confounding effects of language processing, verbal requests were limited to: "Look at the screen". Heat map visualization in Tobii Pro Studio of the eye tracking data was used to analyze data qualitatively. A Student's T-Test was then used to compare the mean values of the four values listed above (Time to first fixation, First fixation duration, Total fixation duration, and Fixation count—all standard metrics in Tobii Pro Studio) for Rett and non-Rett individuals for the focal points of 5 images. This yielded twenty Rett to non-Rett comparisons. Rett Syndrome patients appeared to demonstrate similar fixation patterns compared to Non-Rett individuals and meaningful visual searching strategies. In seven of the eleven images, the areas of greatest fixation duration (red regions) were similar in both Rett and non-Rett heat maps. 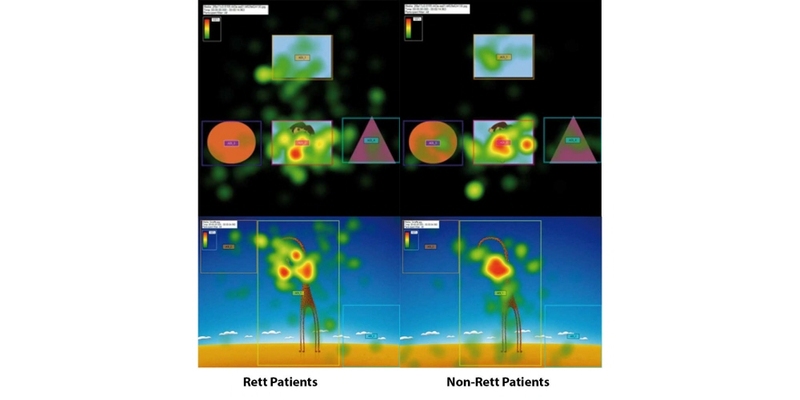 Also, only six out of twenty Rett to non-Rett metric value comparisons revealed significant differences between Rett and non-Rett values, indicating that they observe image focal points in a similar way. In four out of five images with obvious focal points, Rett Syndrome patients did focus the majority of their gaze on the focal point. "The results of this study are extremely encouraging, and demonstrate the feasibility of using eye tracking technology in evaluations of patients with RTT. This is necessary, because any intellectual ability they do possess needs to be exercised and strengthened as if they were a typically developing child."